The photograph shows a male and a large dog looking at each other. 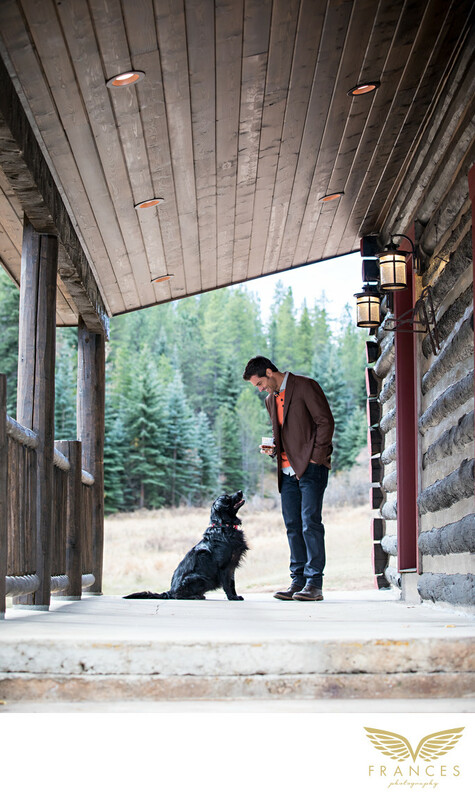 The male model is wearing a dark brown jacket and blue jeans and is staring down at the dog. They are standing outside a porch made from wood and various pine trees could be seen in the background. The number of trees and the grassy area indicate that they are in the woods, specifically a log cabin. The lights on the cabin’s porch are turned on, which shows that this is a well-maintained and lived-in house. The image angle shows that the photographer had to go down the porch’s steps and take the shot while kneeling down or tilting the camera to a higher position. The image looks like a candid shot of a man and his dog in the middle of a staring contest, or perhaps the man is reprimanding the dog or teaching him a few tricks. What is clear from the image is that the dog is familiar with the man and is most likely his beloved pet.